Good news for tech-toting travelers: The world is better prepared than ever to help you get online and keep your laptop, cell phone, and other devices fully charged. Bad news: It is still very far from having universal standards in place. Still, with a little research and a few gadgets, you can keep your costs and headaches to a minimum. Your research should begin when you start making your transportation arrangements. For flights within North America, several airlines now offer in-flight Internet access through GoGo, at prices ranging from $5 for a single journey of less than 90 minutes to 30-day passes for $30 (single airline) or $40 (all participating carriers), with automatically renewing monthly subscriptions for $35. Unfortunately, not all airlines that offer GoGo's service provide power outlets--and Wi-Fi consumes lots of power. Check to see whether outlets are available on a prospective flight; if they aren't, consider bringing an extra battery to ensure that your device stays charged throughout your time in the air. Don't expect to see GoGo on flights to Europe or Asia, however. Since the service relies on a network of transmission towers on the ground, it isn't available during transoceanic flights. Nevertheless, you may still have access to electrical outlets, especially if you're flying first class or business class, in which case you can use your laptop for work or entertainment without worrying that it will die on you. Wi-Fi service is also starting to appear on some trains and buses, both in the United States and overseas. Faced with competing bus services that offer Wi-Fi, Amtrak recently began providing free Wi-Fi service on its Acela express trains and at stations along the northeast corridor (from Boston to Washington, D.C.). In Europe, Wi-Fi is available for a fee on some French (Thalys) high-speed trains but not on the Eurostar line to England via the Chunnel. In general, the Wi-Fi on planes, buses, and trains is adequate for handling e-mail and doing some Web browsing, but it doesn't support high-bandwidth activities such as elaborate online games and virtual worlds--especially when several passengers are sharing the service. Keeping your electrical gear fully charged when you're overseas can be a challenge. Electrical systems in most of the rest of the world deliver 220 volts at 50Hz, compared to our 110 volts at 60Hz (both systems use alternating current but are incompatible). 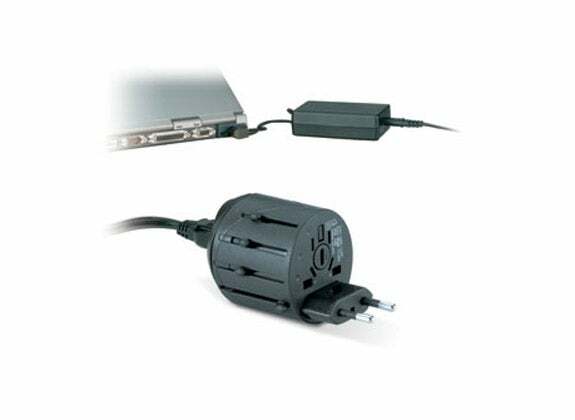 Fortunately, many modern electrical adapters can handle both: If your notebook's AC adapter includes a brick, you're probably fine, and most cell phone electrical chargers can perform the conversion, too. Many other phones have USB chargers that bypass the issue by connecting directly to your notebook. On the other hand, though you're unlikely to encounter hassles in converting a 110-volt device to 240-volt power, the same cannot be said for dealing with the many different types of outlets used outside North America: Most of them won't accept our standard two- or three-prong plugs. England, for example, uses three-pronged plugs that are much larger and bulkier than ours, but most of the continent uses skinnier plugs arrayed with two narrow cylindrical prongs. Before you travel abroad, it's worthwhile to research the type of outlets used at your various destinations; then pack a couple of appropriate plug adapters. Plain-vanilla adapters tend to be fairly inexpensive--maybe a couple of dollars--and many hardware stores stock them. One thing to check for is grounding support: Some cheap adapters don't support the third prong included on our modern electronics, and though the device might work without an adapter for the grounding prong, the unaccommodated prong might prevent the two primary prongs from making a proper connection. The Kensington International Travel Plug Adapter will help you adapt your plugs to whatever design you need. If you plan to travel to more than one country, plug converters that you can configure to support different outlets types are handy. I've had good luck with the Kensington International Travel Plug Adapter 33117 (about $15 as of April 2010), which has slide-out prongs for use in different countries; the only time I've run into trouble with this converter is when a recessed outlet is too narrow for the fairly bulky unit. If you travel with lots of small electronic devices that need recharging (such as laptops, cell phones, cameras, camcorders, and e-book readers), you may have to deal with a shortage of electrical outlets in hotel rooms--especially conveniently located outlets. That's why I strongly recommend bringing a surge protector/power strip along: It protects against surges and allows you to power several electronic devices from a single outlet. Bring along a Belkin Mini Surge Protector to charge your devices during an outlet shortage. 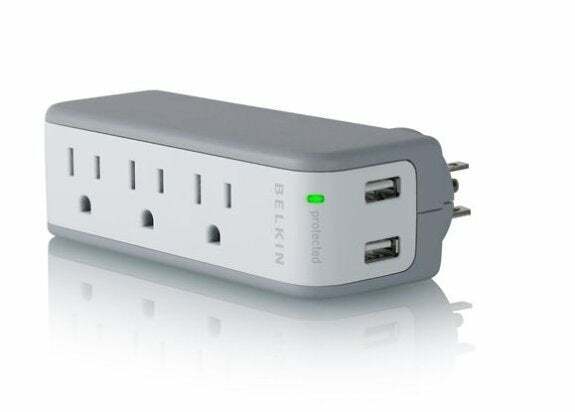 The $25 Belkin Mini Surge Protector with USB Charger provides three standard outlets and two powered U.S. outlets (for your iPhone and the like). Unfortunately, because it's designed to sit directly against a wall outlet (it has no cable), and can fall out of a recessed outlet, especially when weighed down with hookups to several adapters and battery rechargers. I also like the Monster Cable Outlets to Go line of power strips. These strips don't come equipped with USB ports, but they are well designed for travel: You can wrap the unit's short, sturdy cord neatly around the oblong strip and then secure the plug by inserting it into one of the ports. Priced at between $10 and $30, the strips come in three-, four-, and six-outlet configurations.